The Lomami river is huge. We have gone over 250km along it already and it is still over 300m wide. We have another 600km to go! It is a dark river full of detritus. I swim in it and cannot see more than couple of feet in front. No crocs yet! It also has a strong flow. You cannot tread water and stay in one place. You quickly float down the river. It is also remarkably warm for such a huge river. There are many villages along its bank over the first 200km. They are mainly small villages with just a few mud huts but some are much larger containing hundreds of mud huts. Although they all look similar they do, in fact, all have slightly different characteristics. Some will have a church or seem to have some sort of organization. 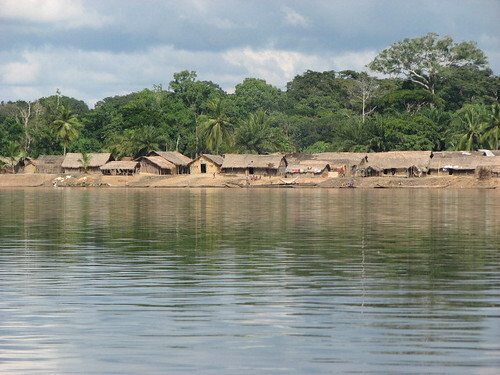 It will take us three days traveling down the Lomami before we get to the final large village, Opala. Some villages come across as friendly with everybody waving and smiling whilst other villages seem to glower; people stare at me and demand things (food etc). Not sure why the villages are different but it might have to do with the prosperity of the village. With all the villages along the edge, at first the forest was quite degraded but now it has changed and I’m getting a real buzz out of what might be in those trees…. Terese Hart, my colleague (boss) in the city, wrote an earlier article on why we are here. This entry was written by Terese Hart, posted on 2007-06-15 at 5:16 pm, filed under About the project. Bookmark the permalink. Follow any comments here with the RSS feed for this post. Post a comment or leave a trackback: Trackback URL.